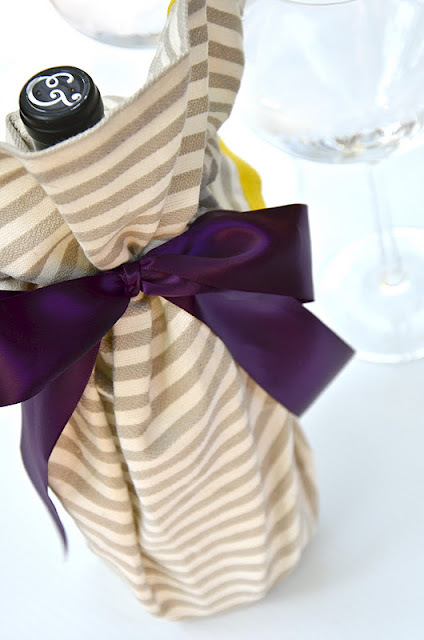 This is a great way to elevate the typical 'I grabbed something from my wine rack as I was rushing out the door' hostess gift to something thoughtful without having to put in too much time or effort. So, I guess...it's thoughtful. Yet not really thoughtful. Did that sentence up there just turn it into the antithesis of thoughtful? Or, just think of it this way - it's thoughtful for both sides! Thoughtful for the recipient in the way it will make them feel all warm and fuzzy, and thoughtful for you in that it's an attainable gesture. Oh, I don't know. I suppose I should have just called this a Hostess Gift Idea instead. The Stallion did mention that he found it odd that I was calling my own gift thoughtful. 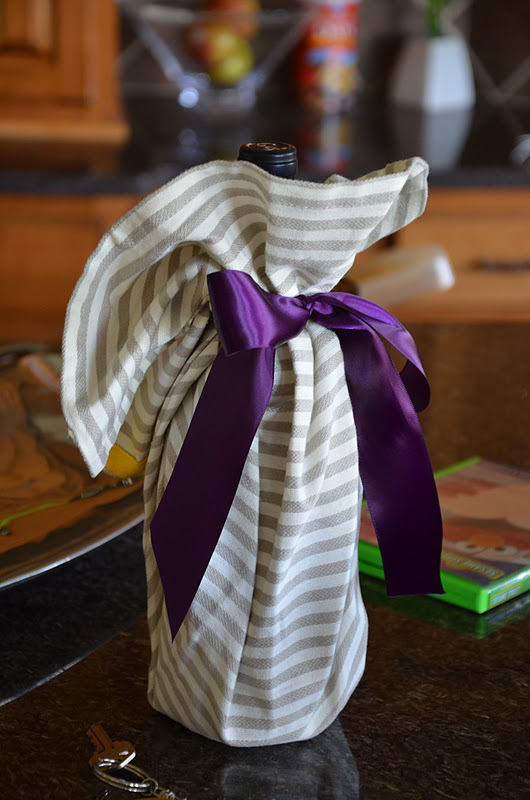 I picked up a 3-pack of dish towels by Dwell Studio the last time I was at Target, sprung for a nice[r than usual] bottle of wine, and pulled some ribbon from my box of reusable wrappings. It takes a little finesse, but simply place the bottle of wine in the center of the towel, gather all the edges up around the neck of the bottle, and secure with ribbon, twine, raffia, etc. We took this to our dear friend M and her husband when we stayed overnight to attend a friend's out-of-town wedding - one that they would not be attending. They have 2 young children, so I didn't even consider them an option. Our hotel was booked when M emailed encouraging us to just stay with them and insisting it was no trouble at all. I'm so glad we accepted. It was so great to have some time to catch up with M, see their new house, and be amazed by how much the kids had grown. We left this on their counter to express our gratitude. We LOVED the bottle of wine, and LOVED the presentation, and LOVE the dish towel!!! So fun catching up with you guys. LOVE this idea. I should probably have some bottles of wine, other then 2 buck chuck, to use for things like this! And maybe a clean dish towel too?!?! nah, clean is overrated.